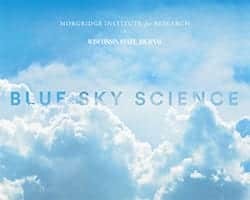 News & Stories > Blue Sky Science > How do you identify edible mushrooms? To identify an edible versus poisonous mushroom, you have to first identify the specific mushroom. In the same way you learn to identify a grapefruit versus an orange—using size, color, smell—you can build up a mental database of different types of mushrooms. If you look at a button mushroom you can see that it’s white, relatively small, and has a really classic mushroom shape. Wood Ear mushrooms look very different with their brownish color and thin shape, but they’re just as edible. Both edible and poisonous mushroom can take different shapes and sizes. Just as when you’re walking in a forest, there’s not just a simple rule that identifies edible plants from non-edible plants. You have to know the thing that you’re holding, give it a name, and then you can understand if it’s edible or not. The best way to understand is to talk to people who already know the difference between a porcini and a chanterelle and a morel and a poisonous Amanita bisporigera. Looking at photographs on the web is a great start, but talking with neighborhood experts or a local mushroom club, going with people into the woods who can share their expertise, is the best way to learn more.